Hello and welcome to this MailChimp Tutorial series. In the last post you saw how to export Mailchimp subscribers and how to change List settings and Campaign defaults. 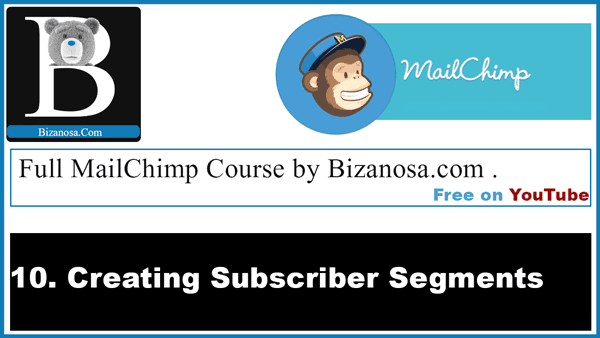 In this post we are going to cover Mailchimp List segmentation. Basically how to create List segments for your subscriber list. Segments can be used to send email campaigns to just a section of a list. Let’s say you have a list that has people that live in different locations. And you want to send a campaign to people living in a certain city. Perhaps, you want to schedule your Newsletter campaigns to go out at different times (Due to Time Difference). So you don’t want your emails to reach your subscribers at night, wherever they live. You can create segments based on the locations where they are. Your list would have to have a field for Location. Which will help you know where they are. And use that for creating the segment. After creating segments, you can choose to just send your campaign to that segment. First of all go to the list you want to segment. To do that, click on Lists , then choose the list you want segments for. In my example, in the video above, I have a column that has titles for my subscribers. The titles are Mr and Dr . And I want to create a first segment that has Mr (Misters) only. I will click on the Segments button . This button is located at the top left. It is next to the button that says Subscribed . Note : If you cannot see this button (The Segments button) , then you do not have the right user Access level. Ask whoever added you to their mailchimp account to upgrade your User Level. When you click on segments for the very first time, it will show: Currently You have no Saved Segments. So to create a New Segment Click “New Segment”. Subscribers Match “any” or “all” of the following : You can choose any or All . This is the rule for filtering through your list. The field to choose from and the rules to apply : These are the fields in your subscriber list. Choose the field you want to use for filtering through your list. I want subscribers whose Title is Mr . So I will choose All (Subscribers match all of the following). And then under fields to use, I will choose title . Because, I want to create a segment whereby all the title are Mr. You can choose the Field you want to use (eg Email , First Name, Location etc) . And then I will type in ‘Mr’ in the text box . In my example, the condition read in one line is: Where All Title is Mr . If I wanted one for doctor, I would just type in Dr instead of the Mr. So that’s the condition for our segment : Subscribers match all where the Title is Mr . So any subscriber with the title of Mr will be in our segment. If you have other conditions, you can add them by clicking on the Add Condition link. Click on Preview Segment to see if it has any matches . As in the example in the video, I can see that “2 Subscribers Match Your Segment”. Click on save the segment . A popup window will come up. Give the Segment a name. Leave Auto-Update checked, so that whenever you add new subscribers they will automatically get added to the segment. You can go back to your List By: Clicking on manage subscribers , then “View Subscribers” . To view a list of your segments, you’ll click on manage subscribers , then “Subscribers” . Click on Campaigns on the main Mailchimp menu. Click on create a new campaign button. We want to send out newsletter campaign to the segment. I will choose a plain text Campaign (this is just a simple example) . Then you’ll see, you can send to your full Subscriber Mailchimp List. You can also choose to send to a saved segment. This is the one for us. Click on the radio button for this to select it. Then choose whichever segment you want to send to. This is the only part that I wanted to show you. We’ll cover Mailchimp campaigns later here . See you in the next post where we are looking at Mailchimp forms.